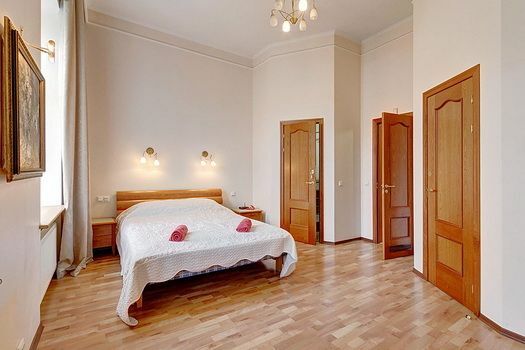 Located in the very heart of Saint Petersburg, this spectacular 2-bedroom apartment is an ideal starting point for city explorations. 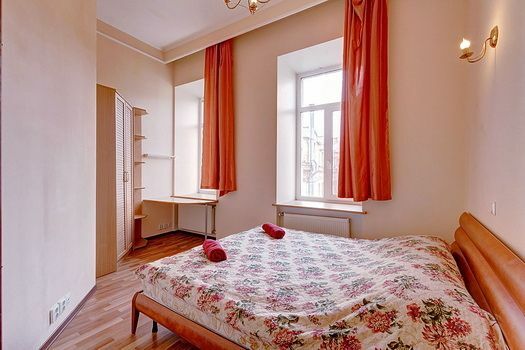 It is located just in a 3-minute walk from the Hermitage, Palace Square, the Admiralty and Nevsky prospect. The apartment is situated on the top floor of 5-story with a lift. 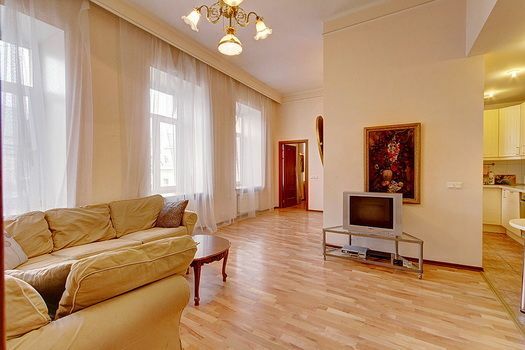 The apartment comprises a cozy living room adjoining to the kitchen area, two splendid bedrooms and two bathrooms. Each bedroom is furnished with a double bed with bedside tables and spacious wardrobe. In the living room there is a sofa, TV, a stereo and DVD player. 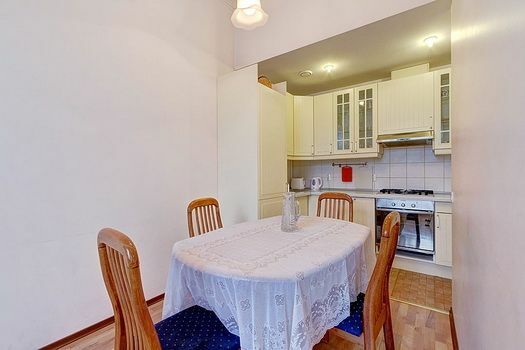 The kitchen area is equipped with modern appliances: a fridge, a gas stove, a dishwasher, an electric kettle, a small table for breakfast and a big dinner table. 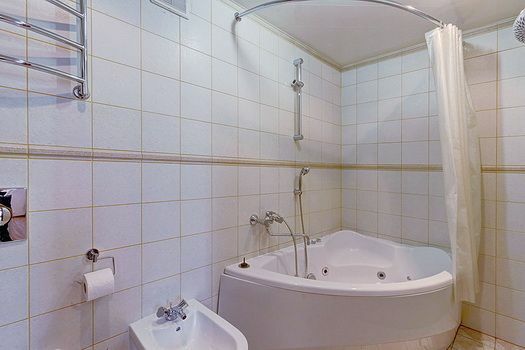 There are 2 bathrooms in this apartment, one of them comes equipped with a shower cubicle, a toilet with washbasin whereas the second boasts a sauna and a Jacuzzi bath. 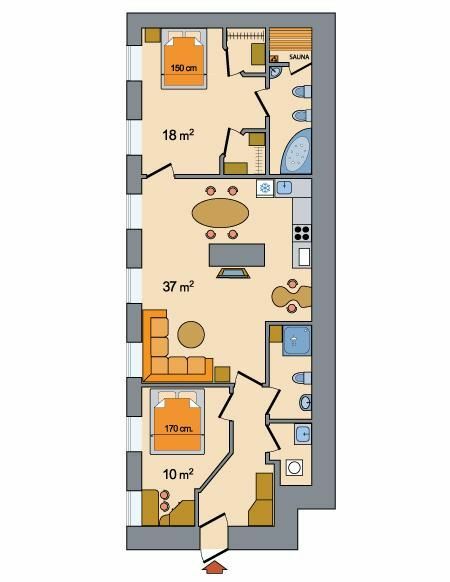 Also there is a separate place for a washing machine, an iron and a draining board. The windows in the apartment have double glazing which will ensure your uninterrupted rest in the evening and at night. 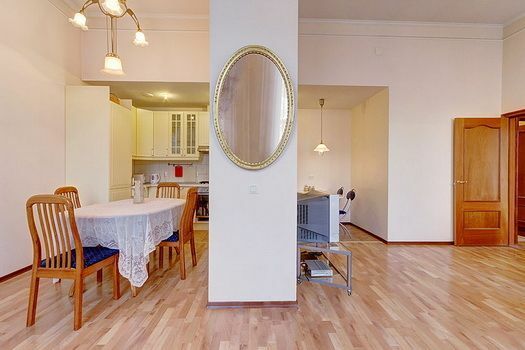 This apartment can be rented with flat 358, that is located in a one-minute walk. This is perfect combination for big families or small groups. 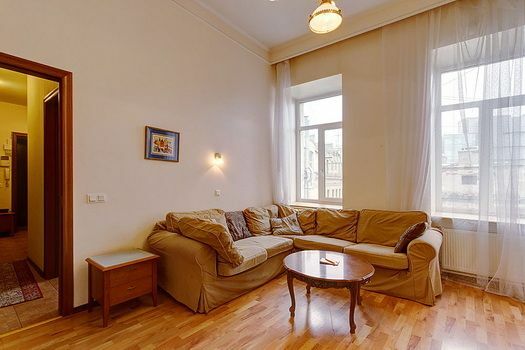 You can access the apartment from Moika embankment through the guarded courtyard, the parking place is available along the street as well. Please note that check-in takes place at the propertys office: Karavannaya Street 7 from 9:00 until 21:00. Guests arriving before 09:00 and after 21:00 are kindly requested to contact the property in advance to arrange check-in.